Sewing is AWESOME and I think more people should be doing it. And since lots of people get sewing machines for Christmas or resolve to learn a new skill for the new year, January seems like a great time to launch something that literally spent all of 2014 on my to-do list. So I aim to grow our community by adding more members – and the only way to do that is if more people learn to sew! 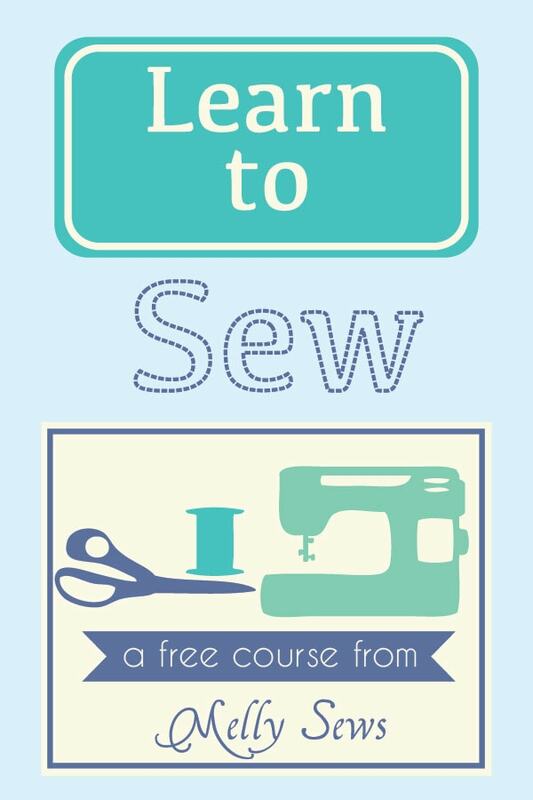 Sign up to get your FREE sewing course emailed to you! CLICK HERE. Check out this video to learn how to tell your doohickey from your thingamabob from your bobbin and your feed dogs and exactly what that uppy/downy part is called. And if for some reason you can’t see the video below, watch it on YouTube here. And just in case you wanted to take notes on that, you can download this free printable to label for yourself. If I talked too fast above, here’s your cheat sheet image (this is the printable with the labels filled in). Alright, we now know the uppy/downy is actually called the take up lever, so let’s move on to how to thread it. Watch the video below to see me threading my machine – and don’t worry if yours is different; they all follow about the same path. In case you can’t see the video below, watch on YouTube here. Close up of the needle area – because I know that was hard to see in the video. And now for your homework for your first project – practice sewing straight lines! 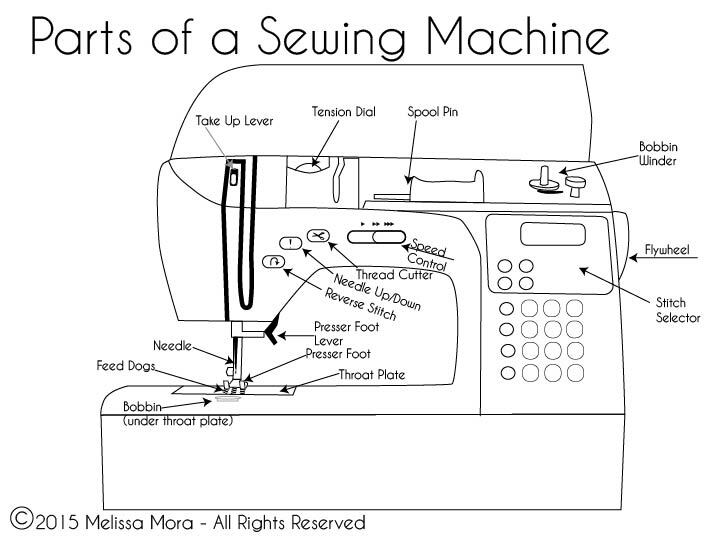 This is the basic skill all sewing is built on. Once you’ve mastered sewing a straight line with a straight stitch, try a zig-zag stitch, and once you get the hang of that, play with any other stitches your machine came with that intrigue you. Sweet! I have a friend that fit’s the bill! I’ll email her the link. Thank you! This is actually perfect for me! I have been really wanting to get back into sewing, but it’s been years, and while I’m comfortable actually using the sewing machine, I couldn’t remember all the names for the parts and I definitely didn’t remember how to thread it. I’m sure there’s a lot of other knowledge I’m missing. I’m looking forward to this series and I hope I’ll manage to follow along! I enjoy having both the tutorials and videos… I find them both very useful. I’m referring to eager young women to your link…I’m excited for them to have this opportunity…and I told them you had some easy Free patterns as well…And it always is a ‘Good Thing’ when it’s help from a Texas gal! Hi. Great site. Well done. I am learning to sew hats and your patterns have been very helpful. Thank you. Cheers! just what I need to start sewing again ,thank you. Sewing a straight line looks easy, but I had to do it several times. I need to practice more. Trying to find the time to do this, especially with Christmas just around the corner. Thank you so much, Melly. I have found your tutorials to be easy to follow. I appreciate the time and effort you put forth to share them. Thank you so for this wonderful tutorials on how to learn to sew. Thank you very much for the tutorials. This is gold for me. Learning fashion designing is hard enough in my country when u don’t have much money. I have not sewed since I was in high school. I’m 66 now. I have such a hard time finding clothes that don’t look like my mom should wear them or my daughters. I know what I like and what I need. I think it’s time to sew again!! I just started following you Melly, and really like your style and personality! I am so grateful for people like you who don’t mind sharing their knowledge with others. There are so many of us that need help. This is my first time on your website and I’m sure from what I’ve seen so far I will enjoy it. Thanks again for having a warm heart to share. Wow, I have learned so much from you. I thought I knew how to sew. We used to make all our clothes when I was in high school (I graduated in 1977). However, I can’t believe how much I have forgotten. It’s been a few years since I have sewn. I made matching outfits for Easter when my daughters were 2 & 4, and they are in their 30’s now. I am going to take your beginner course to see what other things I have forgotten. Thank you so very much for having this page and having all these helpful things to get me back on track!!! Thank yo uso much for your site. As a beginning sewer you have provided with inspiration and improved my skills!. Thank you! I am disabled with way to much idol time on my hands, that desperately needs to be filled. 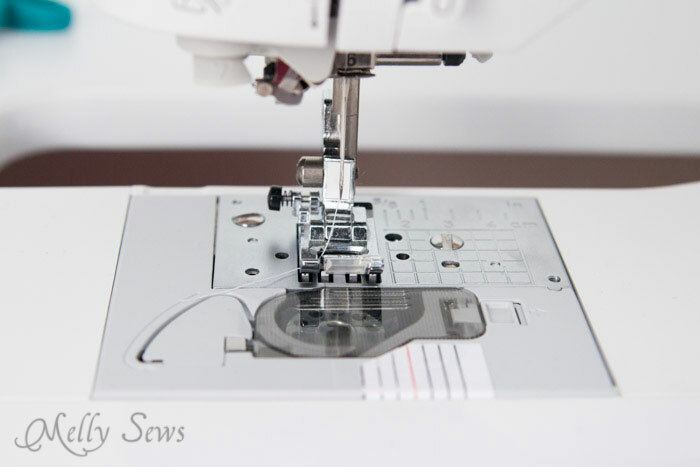 I came across Melissa’s website (which by the way, is very well put together) and though what the heck… I bought a Singer sewing machine at a yard sale for $30.00 and started her online class. After all: learning something new, occupying idol time and if I prove to be any good at it… NEW CLOTHES! It’s a win/win. Interesting – and just what we are looking for. My grand-daughter just received a basic sewing machine for her birthday and it appears this site will really help her get started. Thank you for sharing your knowledge with us. I am just getting back into sewing after dusting off my machine. Im looking forward to the class.